While carbon dioxide is typically painted as the bad boy of greenhouse gases, methane is roughly 30 times more potent as a heat-trapping gas. 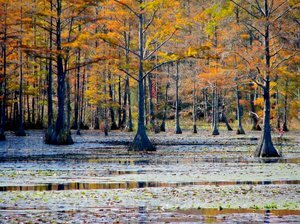 New research in the journal Nature indicates that for each degree that the Earth’s temperature rises, the amount of methane entering the atmosphere from microorganisms dwelling in lake sediment and freshwater wetlands — the primary sources of the gas — will increase several times. As temperatures rise, the relative increase of methane emissions will outpace that of carbon dioxide from these sources, the researchers report. The findings condense the complex and varied process by which methane — currently the third most prevalent greenhouse gas after carbon dioxide and water vapor — enters the atmosphere into a measurement scientists can use, explained co-author Cristian Gudasz, a visiting postdoctoral research associate in Princeton’s Department of Ecology and Evolutionary Biology. In freshwater systems, methane is produced as microorganisms digest organic matter, a process known as “methanogenesis.” This process hinges on a slew of temperature, chemical, physical and ecological factors that can bedevil scientists working to model how the Earth’s systems will contribute, and respond, to a hotter future. The researchers’ findings suggest that methane emissions from freshwater systems will likely rise with the global temperature, Gudasz said. But to not know the extent of methane contribution from such a widely dispersed ecosystem that includes lakes, swamps, marshes and rice paddies leaves a glaring hole in climate projections. To provide a simple and accurate way for climate modelers to account for methanogenesis, Gudasz and his co-authors analyzed nearly 1,600 measurements of temperature and methane emissions from 127 freshwater ecosystems across the globe. The researchers found that a common effect emerged from those studies: freshwater methane generation very much thrives on high temperatures. Methane emissions at 0 degrees Celsius would rise 57 times higher when the temperature reached 30 degrees Celsius, the researchers report. For those inclined to model it, the researchers’ results translated to a temperature dependence of 0.96 electron volts (eV), an indication of the temperature-sensitivity of the methane-emitting ecosystems. Yvon-Durocher, Gabriel, Andrew P. Allen, David Bastviken, Ralf Conrad, Cristian Gudasz, Annick St-Pierre, Nguyen Thanh-Duc, Paul A. del Giorgio. 2014. 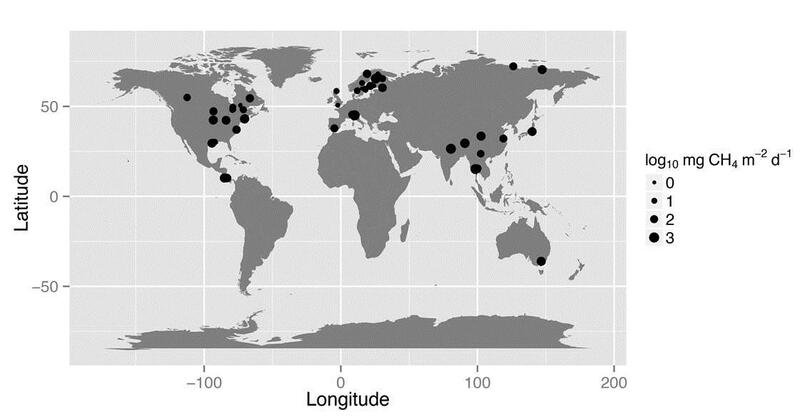 Methane fluxes show consistent temperature dependence across microbial to ecosystem scales. Nature. Article published online before print: March 19, 2014. DOI: 10.1038/nature13164 and in the March 27, 2014 print edition.